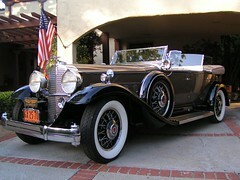 Here’s a nice full shot of Jean Harlow’s ’32 Packard. Gorgeous! Several month’s ago, we blogged on the death of Robert Petersen, whose museum in LA is a world class homage to automobiles. Click here to see this same car on display there. If you’re traveling by CBS Television City in Hollywood and are wondering what’s up with the lines, see this MSNBC article on Bob Barker leaving ‘The Price Is Right’. I remember his as much for ‘Truth or Consequences’, which my memory suggests was pretty funny. There are these two Bob Barker addresses at The Movieland Directory to add to your Bob Barker tour. Throw in a visit to his star on the Hollywood Walk of Fame. And, you have a fun little tour. That means, The Movieland Directory is now running off of MySQL. Then visit the Sample Tours page at TMD. Jump in your car and take the Marilyn Monroe tour. Well…the site is up under the old wimpy database as we iron out this switch to an industrial strength database. If you are visiting Los Angeles, or live there and want to know what you’re missing or just touch base with your history, enjoy the tour! You are currently browsing the The Movieland Directory blog archives for June, 2007.